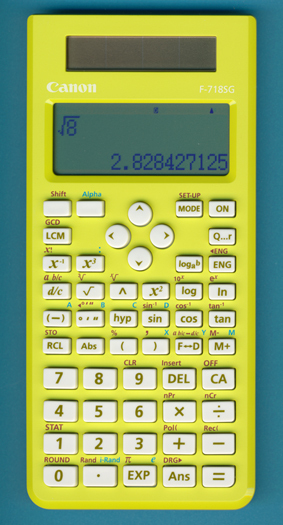 Size: 6.6" x 3.1" x 0.55"
Casio introduced with the fx-115ES already in 2005 an advanced scientific calculator with a 2-line Natural Textbook Display showing formulas and results exactly as they appear in the textbook. Texas Instruments followed mid-2007 with the TI-30XS MultiView and Sharp joined the group with its EL-W531 series introduced late-2007. Canon Inc. marked in 2010 with the F-718S/SA/SGA models their colorful entry into scientific calculators with a large dot-matrix LCD screen. The upper and lower parts of the housing are manufactured from recycled material and on some markets are the calculators equipped with an anti-bacterial keyboard. We discovered as of March 2011 seven different colors: black, white, blue, two shades green, red and magenta. A variation of the F-718SG was introduced on the US market as F-719SG with 38 built-in formulas and a SRP of $ 15.95. In addition to the so called "Math Format" mode the calculator sports a traditional "Linear Format" mode. Dismantling this Canon F-718SG manufactured in June 2010 reveals a pretty common construction with a single printed circuit board (PCB). The PCB hides the single-chip calculating circuit under a small protection blob of black epoxy and drives the graphing display with a heat sealed fine-pitch connector. Please compare the Canon F-718SG with its competitors Casio fx-300ES, Sharp EL-W535B and Texas Instruments TI-30XS MultiView and understand that the it is 98% compatible with Casio fx-300ES! • The algorithm of the Canon F-718SG sport an outstanding precision and faster execution time. Mike Sebastian's "Calculator Forensics" reports an unseen 18-digits result of 9.00000000000072767. • The number of memories was increased from 7 to 17. • The level of parentheses was increased from 24 to 99. • The keyboard looks an feels very cheap and crowded. © Joerg Woerner, March 6, 2011. No reprints without written permission.